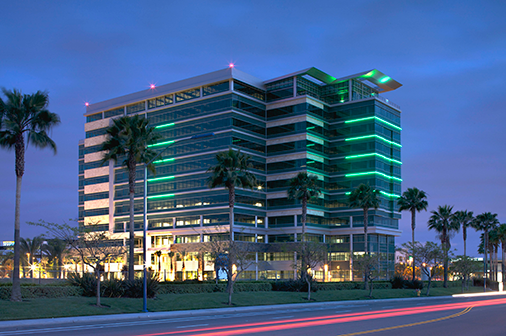 Sunroad Centrum, the iconic 11 story 275,000 square foot building in the center of San Diego, is 100% leased to Bridgepoint Education (ticker BPI) and the Marks Golia Finch law firm. Recognized for its stunning architecture, Sunroad Centrum I features a metal, glass and stone exterior capped by a dramatic swooping rooftop design element. Rough-cut stone combines with interweaving metal detail to provide a strong foundation and create exterior visual synergy. Centrum I was the first speculative Class A building in San Diego to achieve the coveted LEED certification by meeting all six categories which include site selection, water efficiency, energy savings, indoor environmental quality, delighting and wood materials and finishes. Sunroad Centrum is a one-of-a-kind project in a one-of-a-kind location, and its success is demonstrated by top tier tenant selection as the destination for their current and future growth.